I’ve said it before I’m sure, but repurposing projects really are my favorite, especially repurposing projects that make farmhouse styled items. 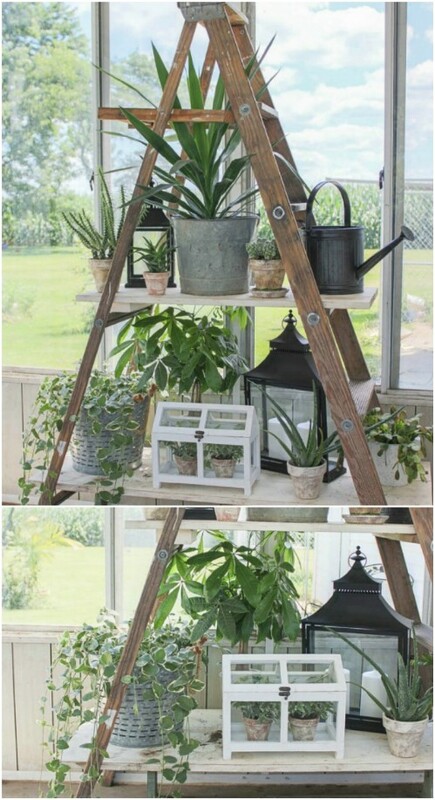 I’ve found a collection of wonderful ways for you to repurpose old ladders that will bring a bit of farmhouse style into your home or garden. If you have an old wooden ladder, you’re halfway there. If you don’t, you can get broken down old ladders at junk stores and flea markets all day long and they won’t cost you much at all. Farmhouse style is my favorite. It’s just so welcoming and warm and all of these projects are sure to give you rustic pieces that you will be proud to display. 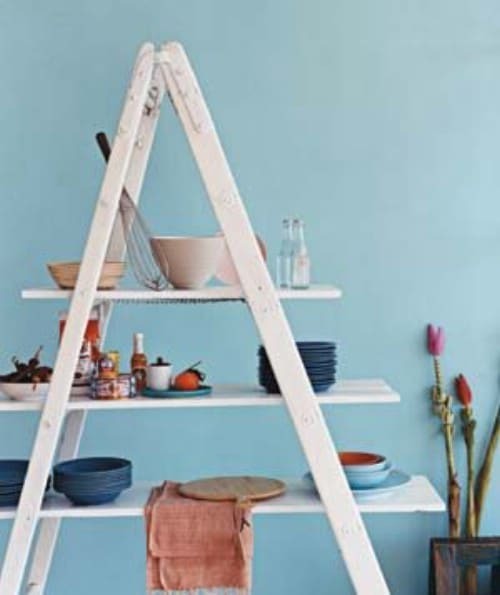 From bookshelves and chandeliers to porch decor and even a great pot rack for the kitchen, there are so many ways to repurpose wooden ladders into great decor. Plus, those old wooden ladders instantly give you a rustic country feel so you can get great farmhouse style from any project on this list. If you really love farmhouse decor, you have to check out these 55 farmhouse furniture and décor projects. If you really love the rustic look, you’re going to adore these projects. 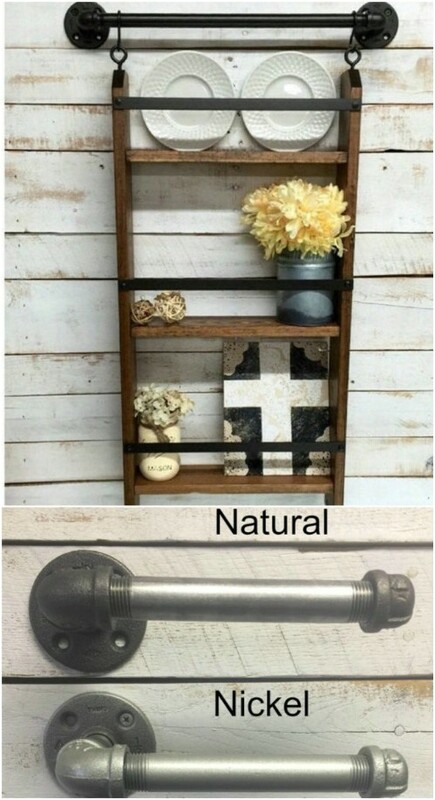 Who knew you could do so many things with an old ladder? Honestly, that’s something that I would have thought was useless once broken, especially if the steps or rungs were missing, but you don’t have to throw that ladder out. you can make wonderful things with it that will instantly decorate your home or make a wonderful gift for someone special. 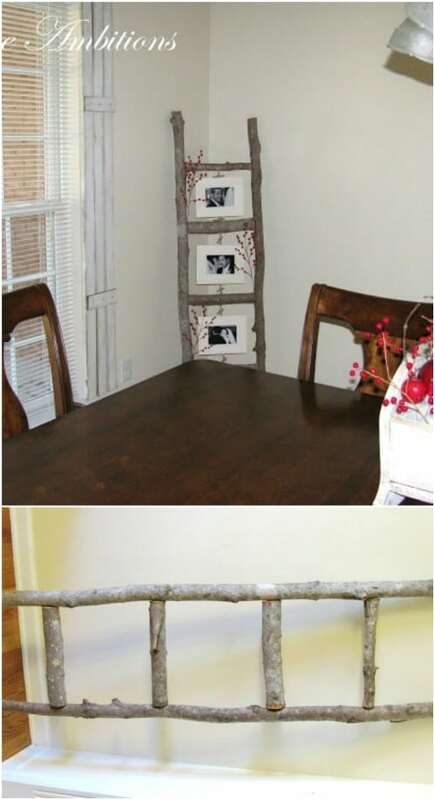 If you love rustic décor, you are sure to find a way in this list to repurpose that old ladder. Also, if you really love rustic décor, be sure to grab a few ideas from these 40 rustic home ideas you can build yourself. I’m so excited to show you these projects. I can’t wait to hear which ones you try. All of them are really easy and give you something that you need whether it’s organization, décor, or just extra storage space. If you’re into repurposing and want some wonderfully unique items to give your home farmhouse charm, this is definitely the collection for you. You can take a double ladder and separate it, turning it into two wonderful bookshelves. If you don’t have a double ladder, just take two smaller ladders and you’ll get the same effect. This is a great rustic looking bookshelf that is as useful as it is decorative and the sides are the perfect width for holding those books in place. 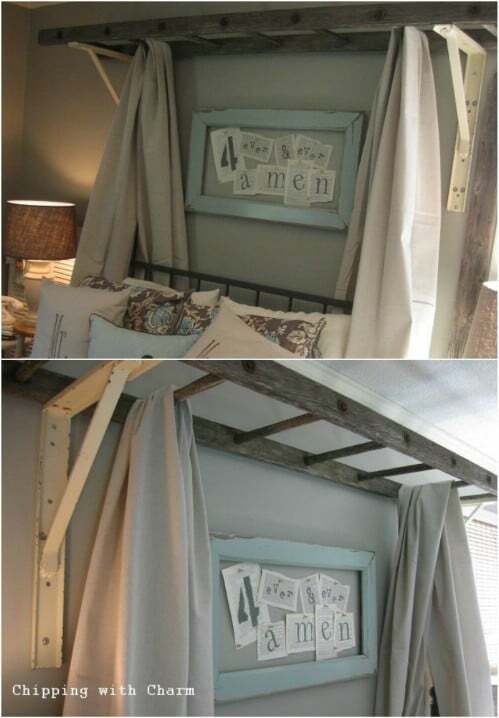 That old wooden ladder would make a wonderful bed canopy. Just add sheer curtains and you’ve got a beautiful, not to mention rustic, canopy. This is such an easy project. You just have to clean up, paint if you want, and then hang your ladder on the ceiling and use it to hook your sheers. I love everything about Pottery Barn – except for the price, that is. If you’re looking to add a great Pottery Barn look and feel to the bathroom, this ladder storage shelf is perfect. You can get basically the same thing at Pottery Barn, but it will cost you quite a bit. DIY it instead and give your bathroom this wonderful storage that has such a lovely farmhouse appeal. Turn that old wooden ladder into a display stand for your birdhouses. 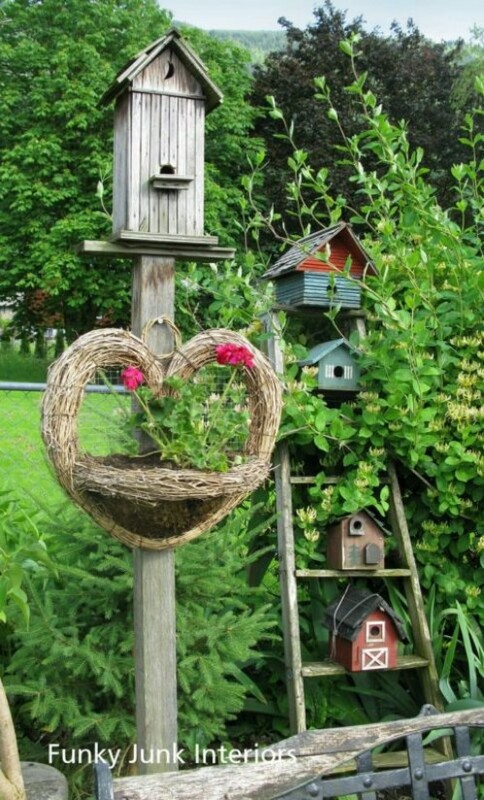 Not only will your birds thank you for their new little community, this is a beautiful way to dress up your yard. Just add your birdhouses to each step on the ladder and you’ll have your own little town of birds hanging out all summer long. Imagine a gorgeous farmhouse chandelier hanging right over the dining room table! 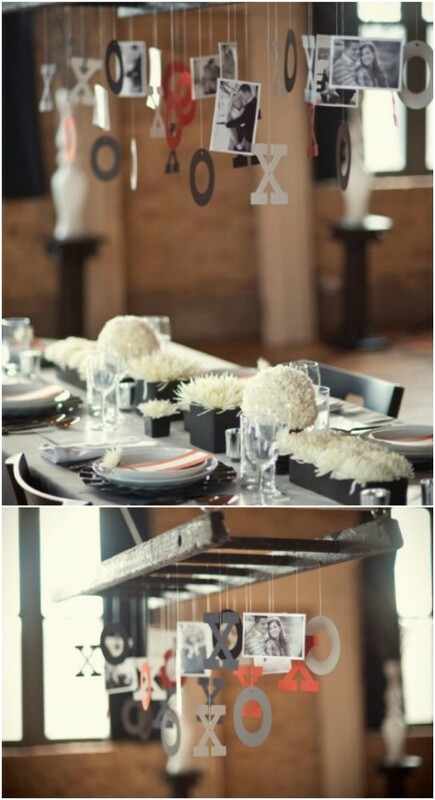 That’s what you get when you use an old wooden ladder and some rustic light fixtures. This makes a gorgeous chandelier and one that will perfectly fit in with your farmhouse décor. It’s not a terribly difficult project either, although you will need to have a few power tools on hand. When it comes to a country Christmas, the more décor the better – that’s what makes this ladder shelf idea so great. You can turn an ordinary stepladder, or even a full sized ladder if you have room, into a wonderfully festive display for your Christmas village or any holiday knick knacks. Add some faux snow and clear Christmas lights and you’ve got yourself a beautiful display for the holidays. 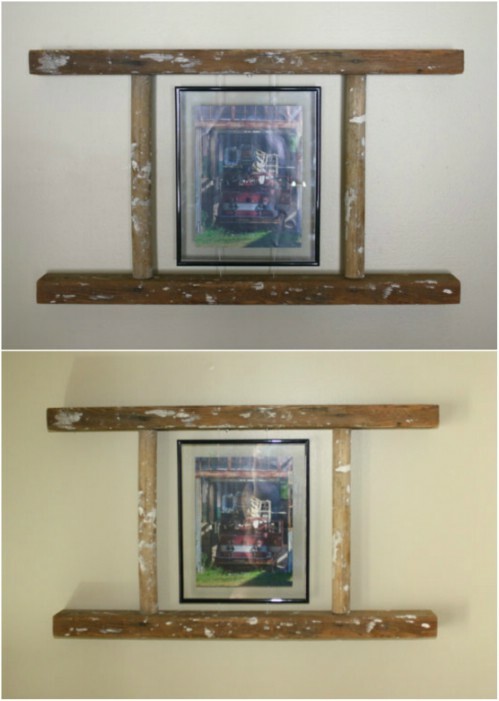 One rung of an old wooden ladder can be used to create these lovely floating picture frames. This would be a relatively easy DIY project to pull off, although I found this one on Etsy. If you prefer to have the farmhouse look without the work, you can pick this one up for about $50. It has a lovely picture inside and the ladder is splattered with paint for a really authentic look. This is a wonderful idea if you’re looking for something a bit less traditional than your ordinary Christmas tree. Instead of digging out the old evergreen, just turn an old wooden ladder into your ornament station. You can hang lights and ornaments from the rungs and even use the steps to display cards and other decorations. 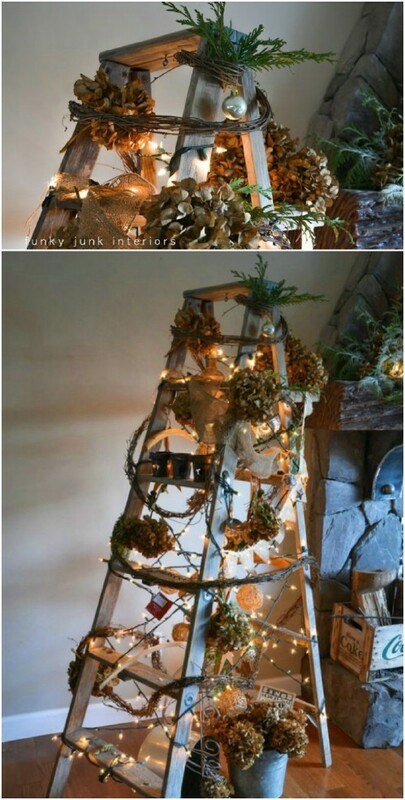 Add some pinecones and maybe some burlap and you’ve got a wonderfully rustic tree. Do you lay out your clothes for tomorrow? A lot of us do and instead of piling those clothes up on the dresser, imagine having this great little white ladder alongside the wall to hang them on. I love this idea for the organization and for the décor. It blends perfectly with bedroom furnishings and it’s such a cute idea. Turn that small step ladder into some amazing storage space. 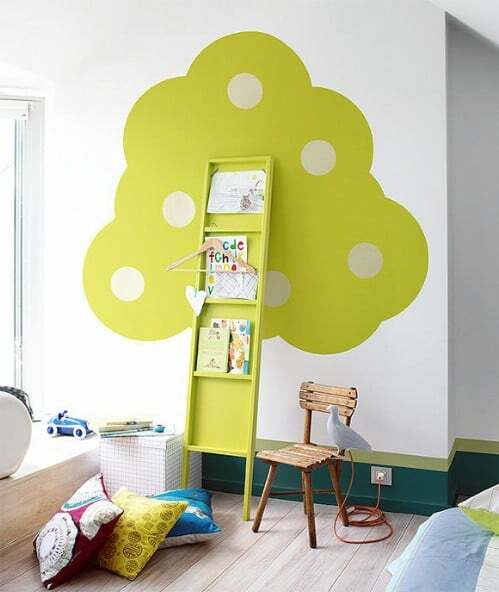 You could do this with a larger ladder as well if you have the floor room for it, or hang it on the wall. The steps and rungs give you plenty of space to create craft supply storage. You could even open the ladder up and add baskets for your supplies. 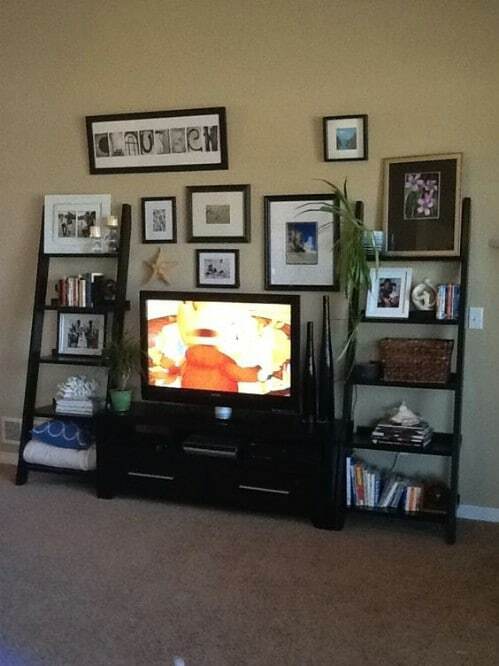 Two ladders on the ends of a dresser or TV stand make a wonderful entertainment center. Just stain, paint, or otherwise color your stand and your ladders the same to make it all match. The ladders can store DVDs, CDs or video games as well as books, knick knacks and so many other things. This is a great – not to mention easy – way to bring a little farmhouse charm into the living room. Sometimes the simplest things make the most impact. If you’re looking for a way to incorporate a rustic ladder into your décor, why not just sit it in the garden and use it to display your plants. The steps give you plenty of room for potted plants and you can add hangers or just let your vines travel up the ladder. An old ladder will certainly bring a bit of farmhouse style into your bedroom, especially if you use it as the headboard. Just turn the ladder on its side and secure it to the wall. Then, you can fill in the spaces with trinkets if they’re wide enough or place small framed pictures inside each one. You could even use both sides of the ladder and put one on top of the other. Really put that old ladder to good use by turning into the perfect herb drying rack. You can use any sized ladder for this, depending on how many herbs you have to dry. Just turn them up and secure the ends and then hang upside down from your old ladder. Put a back on the ladder between the steps and you can make this adorable little bookshelf for your kids’ rooms. You can use one side of the ladder to create each bookshelf and then stand them up against the wall or hang them from the wall. 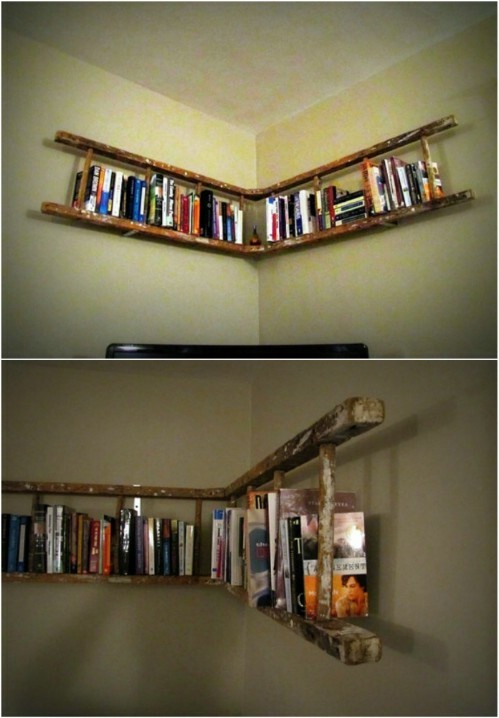 You could also leave the ladder intact and just stand it up with a bookshelf on each side. An old ladder is a great way to add shelving to your kitchen that is useful and gives your kitchen a great farmhouse look. Just stand up the ladder and run boards through the steps to create the shelf. If you have room, this is a wonderful addition to your country kitchen and gives you loads of room for plates, cups, or other dishes. This amazing industrial table is on Etsy for $395 but I had to include it here – it’s just so unique and amazing. It’s an old painter’s ladder that is repurposed into a table and it has a glass top. The entire look is so great and although it is a bit more industrial than farmhouse with regards to style and décor, it would still be a lovely addition to any room. lace – you will always know what page you were on. This is a great way to keep magazines organized, particularity if you get a few home and garden magazines in the mail every month. Store and display your tea and kitchen towels on that old ladder. If you have the room for it, a wooden stepladder is perfect for adding a bit of rustic charm to the kitchen and storing your towels, keeping them within each reach. I love this idea to add decor to the room and to give you somewhere to hang those towels aside from the oven handle. 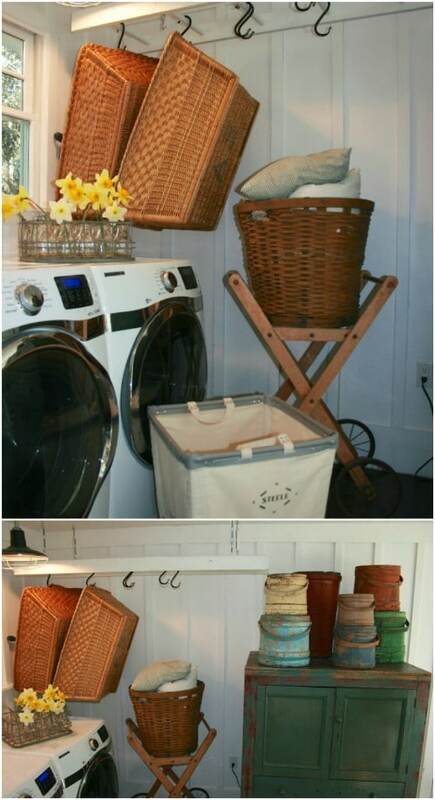 An old wooden ladder, some S hooks and a few laundry baskets give you the perfect laundry room addition. You can repurpose an old ladder into this wonderful storage hanger for those baskets to keep them off the floor and out of the way when they are not in use. It hangs from the ceiling so it won’t take up needed floor space. 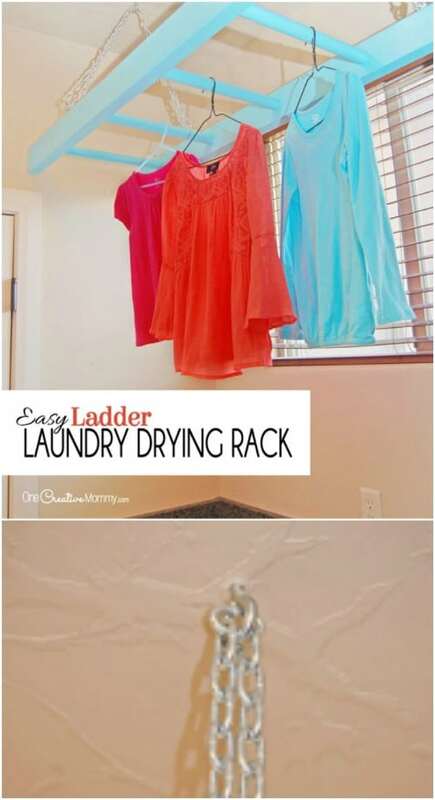 You can also chain that ladder to the ceiling and use it for a neat laundry drying rack. Since it’s on the ceiling, it’s not taking up any floor space and it does a wonderful job of holding laundry while it dries. You can get several hangers on each rung so it also makes a wonderful sorter for when you pull your clothes out of the dryer. Repurpose that old ladder into a mini closet – this is a particularly good project for those who don’t have a closet in their bedrooms or perhaps have a really small closet and just need more space. Just secure the ladder to the wall and it makes an instant closet with spaces to hang clothes and a neat shelf on top for storing shoes and other items as needed. If you have a mud room or just a space near the backdoor, you can add this great ladder turned storage to give you somewhere to hang up jackets and keep muddy shoes and boots off the floor. Old painters’ ladders look great hanging up in a farmhouse mudroom and they’re easy to hang and offer tons of storage possibilities. 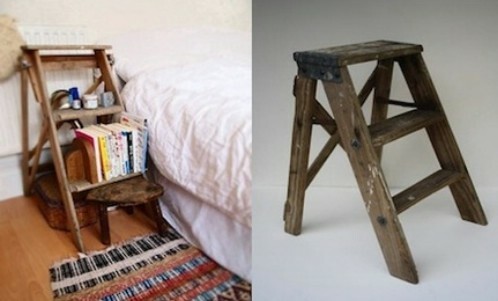 I love the simplicity of using an old step ladder as a bedside table. This is a great way to bring some rustic farmhouse charm into your home and the step ladder is the perfect height to work with most beds. You can even add boards across the steps if you need extra storage – these shelves will give you enough room for everything you need at your bedside. 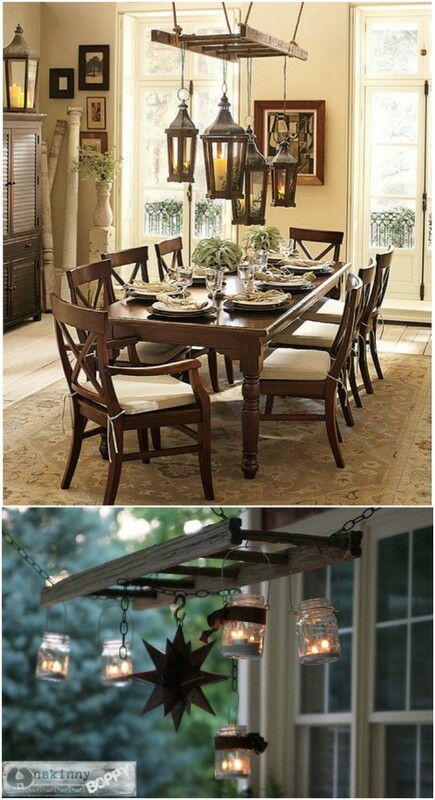 I love the ladder lantern hanger from Pottery Barn but I certainly don’t love the price. You can make that yourself from an old wooden ladder and a few mason jars – you know how much I love mason jar projects! This would be a gorgeous lighting solution for your front or back porch or a patio deck. The mason jars could hold clear lights or you could turn them into tealight candle holders if you prefer a more natural light. That old ladder would look great on your bedroom wall holding all of your favorite jewelry pieces. Necklaces, bracelets, and even scarves will hang perfectly from the rungs and give you loads of storage – plus it keeps chains from being tangled. 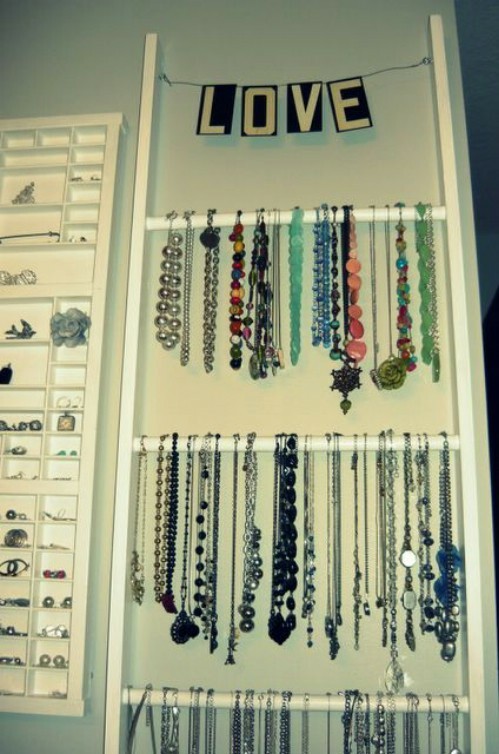 This is perfect for a teens’ room if you have a teenager with lots of jewelry to store. 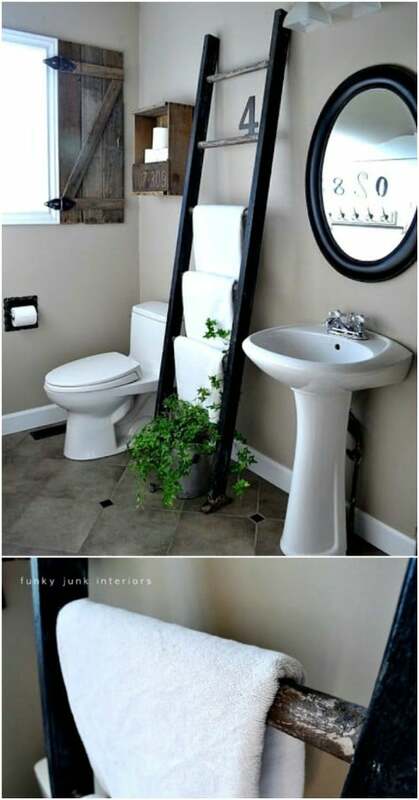 I love this old ladder turned into storage for over the toilet. 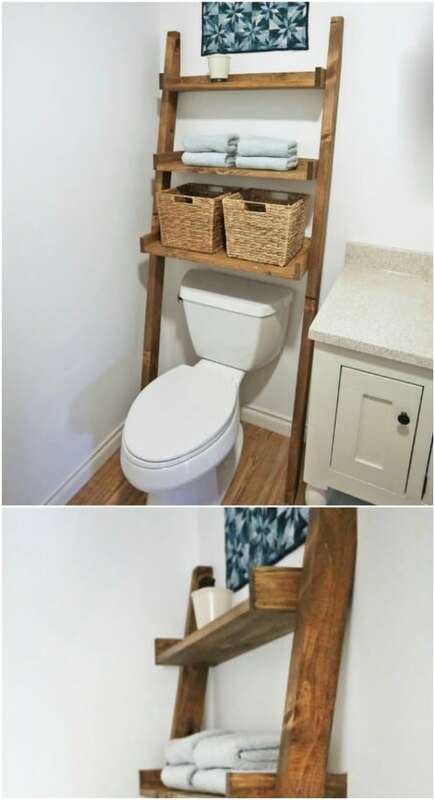 It’s a great rustic look and gives you so much storage space for towels or toilet paper – or you could add wicker baskets to hold so many things. The entire look is wonderful and you can easily recreate it with an old wooden ladder and some boards to create wide shelving. An old ladder makes a wonderful photo display. You’ve probably seen those ladder shaped picture frames from Hobby Lobby or other higher end stores that cost around $50 each. 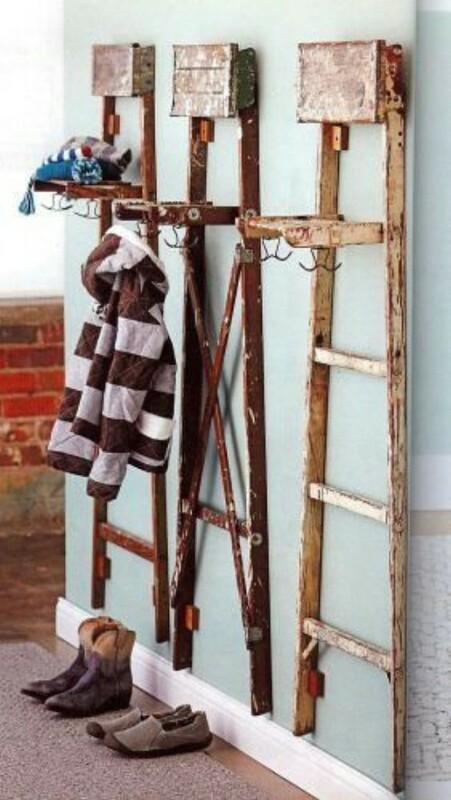 You can make your own with an old wooden ladder and a bit of time. 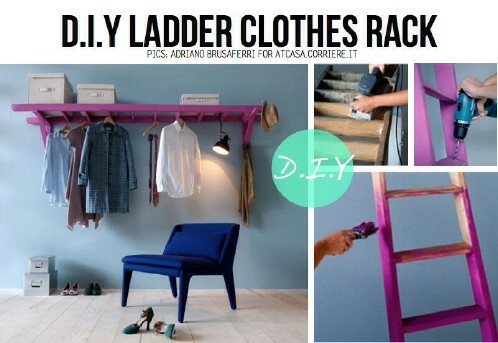 You’ll need to decide if you want your ladder painted or stained and then just stand it against the wall or hang it up and add your pictures. What better way to display your collectible plates than with this rustic ladder plate rack? If you want to add farmhouse appeal to your kitchen or dining room, this is the perfect way. 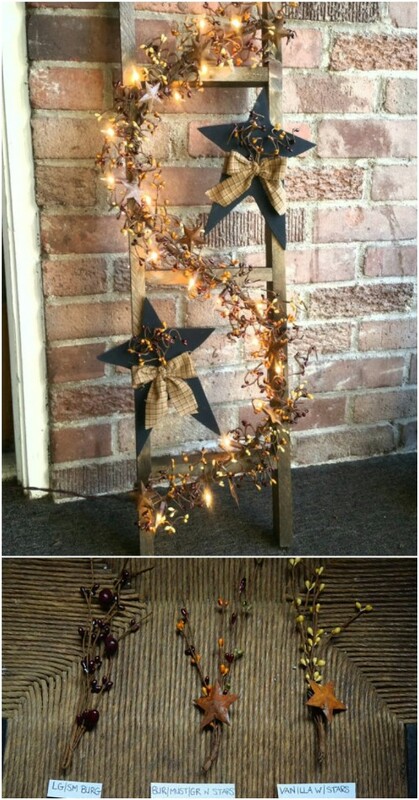 You can make this yourself from an old step ladder or pick this one up on Etsy. It’s got hangers already attached and a beautiful black metal rail to keep plates firmly in place. gs. This is a lovely idea and gives the whole room such a wonderful rustic country look. Laminate your pictures before you hang them to protect them from dust and damage. Whether you want to keep your plants on the porch or in the house, an old ladder and a couple of spare boards will create a beautiful display for them. 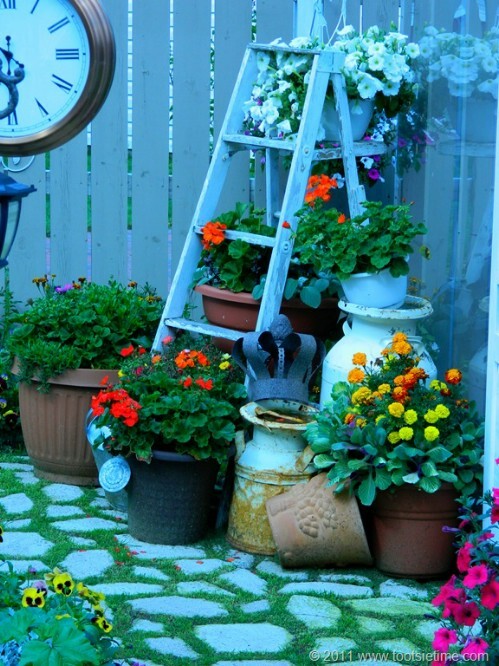 Just line up the boards through the ladder steps and then fill your old ladder with beautiful blooms and greenery. This is a stunning sun room or porch display and keeps all your plants together for easier watering. I have to admit, a pot rack is my favorite kitchen accessory and I love the idea of creating one with an old rustic ladder. You can easily hang the ladder from the ceiling and then just hook your pots and pans up with S hooks. 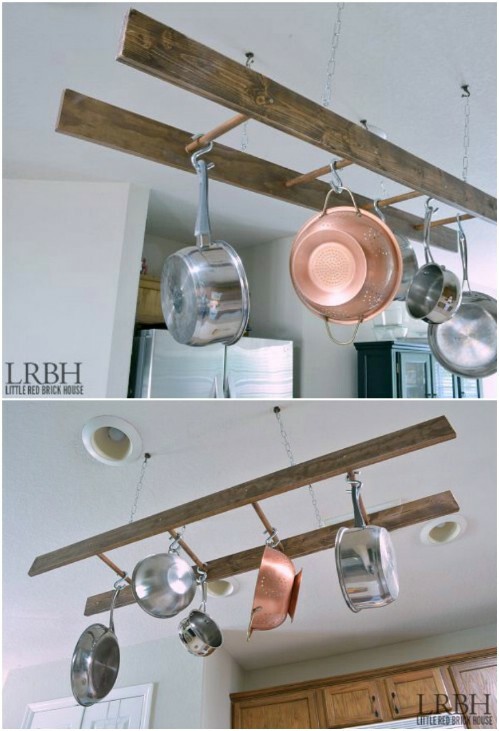 This is a wonderfully easy project, and imagine how much room you’ll have in the cabinets when you hang those pots and pans from the ceiling! I love my quilt rack – it gives the home such a wonderfully warm and welcoming feeling to have vintage quilts on display. If you don’t have a quilt rack, you can easily make one with an old step ladder. Just lean it up against the wall and hang your quilts from the rungs. If you have a double sided ladder, you can separate it and have a quilt rack for two different rooms! 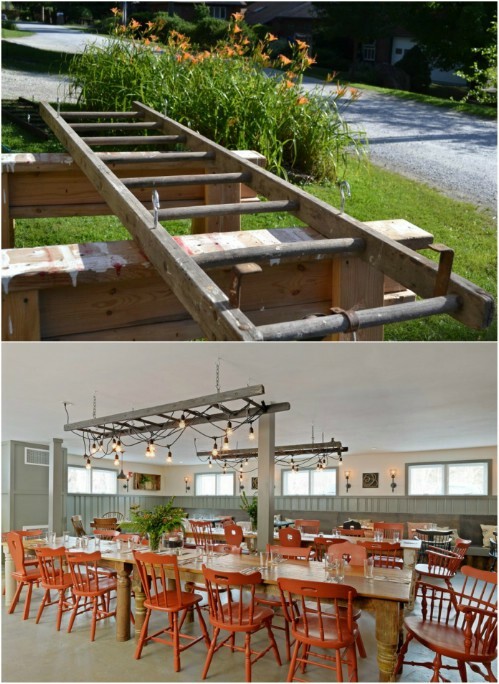 If you’re planning a wedding, particularly a country wedding, a ladder will come in really handy. 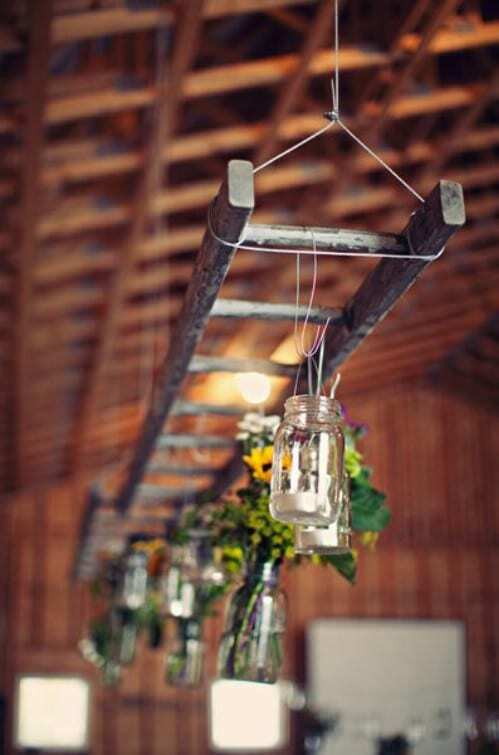 Just hang up your ladder and use it to hang mason jars filled with flowers or candles. You could also stand the ladder up and sit the jars on it. Decorate it with burlap and sheer or tulle and you’ve got a beautiful wedding decoration that costs ten times less than what a florist will charge. 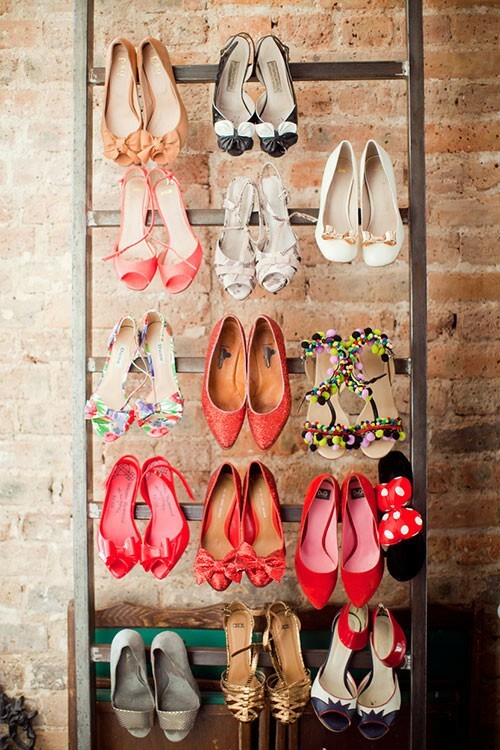 That old ladder is perfect for creating some extra shoe storage. If you own a ton of shoes – don’t we all? – then you can just stand your ladder up against the wall, or hang it if you like, and use the rungs to hold those heels perfectly in place. Tennis shoes and flats won’t really stick as well, but you could incorporate shelving on top or between the steps for shoes that don’t have a heel. 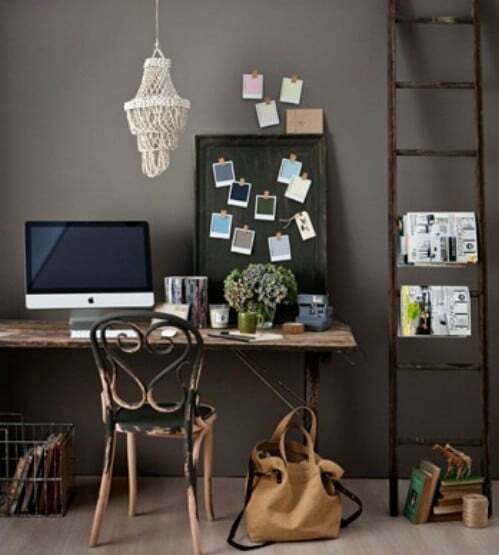 This little step ladder side table is gorgeous and it doesn’t require a lot of work. If you don’t want to do anything but clean it up, that’s fine. It looks much more rustic if you don’t paint or stain it and if it has a few paint splatters, that’s even better. Just wipe it down and sit it right there beside the sofa for a great farmhouse side table that even has storage on the steps. 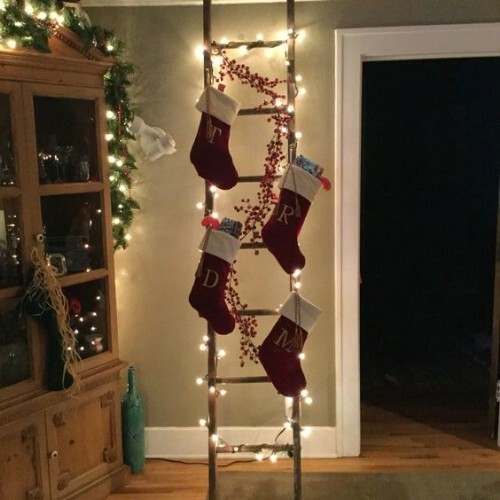 I love the idea of using an old ladder to hold stockings. If you don’t have a mantel to hang your stockings from, this is the next best thing. Just stand the ladder up and add hooks to hold your stockings. Plus, you can decorate it with evergreen twigs, clear lights, and any number of other things to make it extra festive. With just a few wire baskets and some other supplies, you can create this great storage shelf from an old ladder that gives you loads of room for so many things. This would be a great catchall for the bedroom – just drop your keys and other items into the baskets so you always know where they are. Or use the baskets to store anything from bathroom essentials to toys for the kids. I love dressing up my front porch with rustic décor and this ladder is perfect. If you want to add some farmhouse style to the porch, this is a great choice. It’s lit with clear lights and even has berry garland and other wonderfully country looking embellishments. You can get this one on Etsy and it’s good for indoors or out – so hang it in the living room if you prefer or stand it up on the porch. This repurposing idea is probably my favorite. 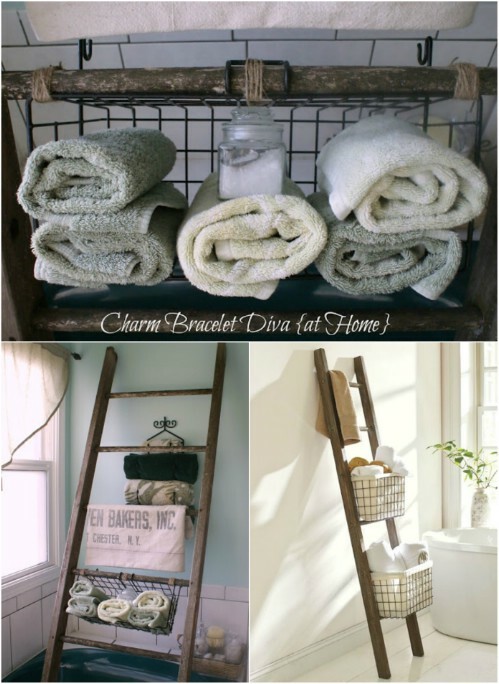 Turning an old ladder into additional towel storage is genius and it gives the bathroom such a wonderful rustic look. You just stand the ladder up against the wall, leaning out just a bit to keep it in place, and then hang your towels from the rungs. This is perfect for next to the bathtub or shower to keep extra towels on hand and it gives off such a great decorative vibe, too.